The EV Card is an easy way for EV drivers to share charging stations." In late 2010, two major grant awards signaled a huge boon for Oregon’s transportation electrification efforts. First, the Oregon Department of Energy (ODOE), using Recovery Act dollars through its State Energy Program (SEP), awarded ODOT $915,000 to extend the three-phase, 480V fast-charge network along the I-5 corridor. On March 16, Oregon Leading the Charge Toward Electric Transportation By Ashley Horvat, ODOT Transportation Electrification Project Manager 2012, the first major stretch of the “West Coast Electric Highway” went operational, with a network of 10 EV fast-charging stations along Interstate 5, from Halsey (Exit #216) to Ashland (Exit #14). Spaced approximately every 25 miles, the charging stations instantly expanded the range of EVs in Oregon. ODOT and its partners hosted grand opening events at the charging stations in Central Point, Grants Pass and Wolf Creek. 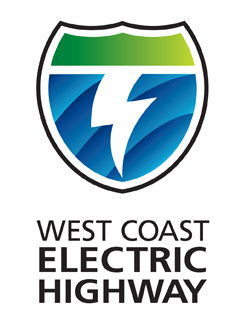 Ultimately, the West Coast Electric Highway will provide seamless travel between Washington and Oregon, and in the near future, California, as all three states are working together to use the same host site and charging station specifications. The second major grant in 2010 came from the U.S. Department of Transportation, which awarded ODOT $2 million in TIGER II funds to install electric vehicle charging infrastructure in up to 22 Oregon communities. This project will create a widespread network of DC fast-chargers that will provide electric vehicles with charging opportunities between Oregon’s major population centers.